Chartered accountant course in India is a professional course which involves both skill and knowledge Assessment. CA course is designed in such a manner that Student can get the professional certificate at any stage of their life as there is no age limit to this. The course is scheduled to be completed in 4.5 years. We got inspired to write this article about “CA course duration, when we got the query from a CA aspirant on 23rd January 2019. He is a student of 12th std and will appear for exams in March 2019. He poured down the questions related to course duration which were confusing to him. We were glad to help him and unravel his notions, regarding the duration of the CA course at the end of the conversation. How Much Time Will It Take to Clear My CA Course After the 12th Examination? MCC: We want you to understand the fact that CA is a holistic professional course which creates an analytical and skillful set of Accountants, who can meet the demand and expectation of the market. Is It Possible to Register for CA Foundation after My 10th Examination? How Much Duration I Must Consider for CA Course After 10th std Examination? MCC: Earlier student was eligible to register for CPT course after 10th std, but from July 2017 in New revised scheme of training, any new registration is seized under CPT. The new candidate applies for Foundation course, where eligibility to apply is only after appearing for 12th std. So, if you are studying in 10th standard in 2019, you will require a commitment of 6.5years to become a CA. I Want to Ask, What if I Miss Registering Myself for the Course, or Want to Apply After My Graduation? Allow graduates and other qualified students to pursue this course through the direct entry route. After appearing in the intermediate level of CS or CFA. In Direct entry, route student is exempted from Foundation level. MCC: yes, you got it right. MCC: yes sure, feel free to ask from our experts. Can He Apply for CA Course? MCC: We want our reader to understand the fact that CA is a holistic professional course which creates an analytical and skillful set of Accountants, who can meet the demand of market expectation. Understanding the significance of commitment to this course, ICAI has barred any other professional course to be undertaken simultaneously. Hence, your Elder brother cannot register under the CA course. but if he wants to switch over from CS course to CA course then he can register under Direct Entry option. Student: Thanks for the information. I Understand Whatever You are Saying But What If I Don’t Clear My Exams at Any Level? MCC: This would be “twelfth of never “case for MCC students, but still We don’t outlook such possibilities. Knowing the gravity of the course, ICAI gives the opportunity to reattempt the exams on failure for a specific period. The student has the opportunity to re-attempt the examination in case of failure of their first attempt. In that case, the time is extended accordingly. We assume that you will be able to clear your 12th std exams with more than 60% marks if you are from science or arts background and 55% if you are from commerce background, to become eligible for registering under foundation course. We assume candidate to register for eligible level on the very first registration dates available. The student has cleared CA exams at all levels on the first attempt. The student undergoes practical training ICITSS and AICITSS during their study period for intermediate and Final level. Student: Ok! So that means I need to clear all my exams at first attempt and register for all levels and training schedule on time and undergo my practical training during my study period, then I will clear my CA in your time frame. MCC: you got it right. Students should be updated with the Important dates and any miss in that will extend the duration of their course. Please read our article CA timetable for May and June 2019 for the upcoming events dates. The selection of groups should be made on basis of your preparation, not to save time. 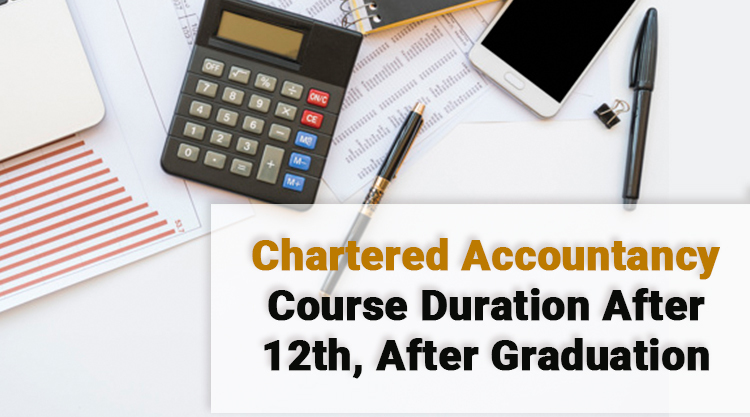 Hope you got the answer of what is the duration of the CA course in India, Chartered Accountant course duration after graduation and how many years for CA after 12th. Keep yourself healthy and diligent. Please feel free to comment and ask from our experts.